South Carolina Gov. 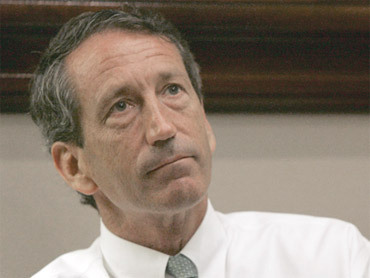 Mark Sanford's divorce will become final next month, just over a year after the first lady discovered his affair with an Argentine woman he later called his soul mate. Family Court Judge Jocelyn Cate said Friday she plans to OK Jenny Sanford's request to split from her husband of 20 years. The divorce will become official in mid-March. Jenny Sanford attended the 20-minute hearing without her husband. Afterward, she said she considers it "the beginning of a new chapter for me and for our children." She filed for divorce in December on the grounds of adultery, saying reconciliation efforts with her husband had been unsuccessful. "The dissolution of a 20-year marriage is not a cause for celebration," she said Friday. Mark Sanford had told his staff he was going hiking along the Appalachian Trail and disappeared for five days last summer, returning to publicly confess he had been in Argentina visiting Maria Belen Chapur, his mistress for a year. Even after the publication of passionate e-mail exchanges between her husband and Chapur, and an Associated Press interview in which Mark Sanford called Chapur his "soul mate" and admitted "crossing the line" with other women, Jenny Sanford said she was willing to reconcile with the two-term governor. The first lady said she had learned about the affair in January 2008, when she found a copy of a letter written to Chapur by her husband, once considered a possible 2012 GOP presidential contender. In the months that followed, he asked several times for permission to visit his mistress. She said no. The day his wife filed for divorce, Sanford blamed himself for what he called "the moral failure that led us to this tragic point." In a reply to the filing last month, the governor admitted the affair and asked the court to approve his wife's request to end their marriage. Jenny Sanford spoke briefly in court Friday, reiterating claims that her husband had been unfaithful to her, explaining her discovery of the letter and the couple's attempts to reconcile. The couple's divorce agreement was filed under seal. Jenny Sanford has moved out of the Governor's Mansion in Columbia and is living with the couple's four sons at their beachside home on Sullivans Island. Sanford, 49, is the first sitting governor to divorce in South Carolina, which in 1949 became the last state in the country to allow it. It's not all that unusual for a governor to get divorced in office. New York first lady Mary "Tod" Rockefeller divorced Gov. Nelson Rockefeller in 1962 over his affair with a staff member, and Nevada Gov. Jim Gibbons is in the process of divorcing first lady Dawn Gibbons. In December, Sanford also became the first South Carolina governor censured by the state's lawmakers, a vote that followed their unsuccessful efforts to impeach him. Earlier this month, Jenny Sanford published a memoir, "Staying True," and made rounds of media interviews to promote it. In the book, Jenny Sanford wrote that her husband asked her advice about his romance and how to deal with the media after she discovered his affair. Sanford spokesman Ben Fox said Friday the governor was in Columbia reviewing legislation. In a statement, his office noted "first lady" is not an official role and said the state would no longer provide Jenny Sanford with a staff assistant.